A: Entering the IBA Competition can't be easier, simply fill out the On-line form, agree to the Term and Conditions and upload your most incredible art. Once your Art has been posted on our website, you have entered the competition and the public can view your artwork. After the submission period has closed our jury will select the images that make it into IBA 7. A: Infected By Art is one of the only Art Contests to offer On-line submissions and Cash prizes, as well as Publication in our up-coming Art book. A: Anyone in the World. We believe that by having this contest take place on the Internet, much more Amazing art will be seen by people visiting our website, and that is the goal of Infected By Art. This award will be voted on only by those artists who submitted entries to IBA7. Each artist who submits at least 6 works of art qualifies. We will email every artist who has submitted work to IBA7 and ask them to select artist's work should receive this award and provide instructions on how to submit their votes. Q: When should submitted artworks be created? A: Artworks should have been created in the last two years - since September 2016. The fee for each Image upload is the lowest of any contest that we know of, especially with our 5th and 10th images being absolutely free! The Cost of printing this High Quality book, Marketing it, and making it available globally is substantial. We offer large 1 or 2 images per page in the book. We do not want TINY images of your art tucked away with 4 or 5 other images on a single page. Each amazing Image in this book is a celebration of your talents and should be displayed as such. 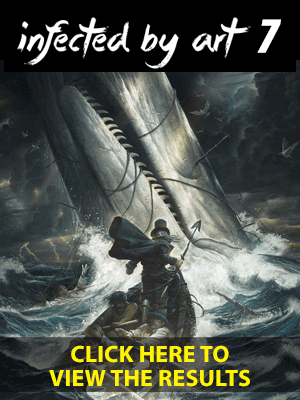 Q: If my art is juried into IBA7, will I receive a copy of the book when it ships? A: Artists who submit at least 3 paid entries into the competition and make it into the book will receive a free copy of IBA7 when it ships. Artists who reside outside the USA and UK will have to pay shipping. International shipping from the ArtOrder's UK location can range from $22 US to $32 US. The book weighs around 4 lbs. A: There is no minimum or maximum image size, however, if your image(s) is selected to be a part of our book, we will need a hi-res image to print from. Once the jury has selected the artworks for the book we will also send out a request for an updated print ready file to be used for publication. When you upload your image to the competition we recommend an image that is 300 DPI and no taller than 2,000 pixels. A: Yes. Once we're at the stage where the book is delivered to the printer we will open up pre-orders for IBA7. A: No, we are not affiliated in any other websites, however, we have developed relationship with certain companies in order to Co-Market our contest. 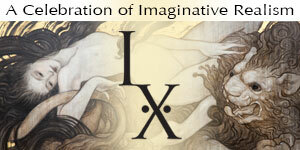 Gallery Owners of IBA who create traditional works of art that are also for sale have those images shared on the ComicArtFans.com IX Exchange.